Exercise – Rest – Exercise | 5-6-7-8 Dancing My Way to a Healthy Me! Yes, I used the “E” word… Eeeeeekkkk! I know that I have declared publicly that I am NOT going to Exercise however, for this post I need to use the e-word for the sake of clarity. To recap: “Exercise” is any activity which produces a physiological effect that causes your heart rate to increase for a set period of time and causes your respiratory system to speed up. In “Plane Anglish” = IF your heart is racing and you are breathing heavy, then it is exercise. The key is . . . Your body is lazy. It does not want to work. And face it, anything that gets your heart going and chest heaving is WORK! The “work” may be climbing the stairs at a baseball park to enjoy a great afternoon watching the Cardinals, but climbing those stairs still counts as WORK even if it is in the pursuit of fun! It may involve rolling around on the floor playing with a passel of puppies, but when you get up, if your heart has speeded up and your breath is starting to make noises like an old-time steam engine then that is work! Even if it is FUN work. For those of us in truly abysmal shape . . .
Just getting up from my computer and sorting the laundry leaves me huffing and puffing and making sounds like the proverbial big bad wolf. The POINT, friends, neighbors, dearest readers, and the odd cuzin or two… It does NOT MATTER WHAT YOU DO AS LONG AS YOU DO SOMETHING! For those of us who are either starting for the first time or climbing back on the “exercise wagon” after falling off, well a little goes a looooooooooooooooooong way! Rest after exercising . . .
What really goes on in your body when you start an exercise program. The idea here is that those lazy muscles, including the heart which is a muscle, do NOT want to “get in gear.” They would MUCH rather lay around doing nothing. So, inside your body are a bunch of muscles that have gotten used to laying around and reading the swimsuit edition of “Muscles Illustrated,” watching funny cat videos online and generally not doing much of anything. Then one day, you, the person in the driver’s seat of your body, decides, “Enough is enough!” I am going to get in better shape! Starting NOW! And you go for a walk in the park or do an extra load of laundry or in some cases just sort the laundry. This produces an effect on your muscles and circulatory system akin to that which happens on the bridge of the Enterprise when the nasty-alien-of-the-day starts shooting! RED ALERT! ALL HANDS ON DECK! Whoop! Whooop! Flashing red lights, the deck tilting, basically complete chaos! Everything inside your body leaps into action in support of your decision to “go for a walk in the park” or “sort the laundry.” Red blood cells man the phasers, the muscles rev up the warp drive, the lungs start pumping ion charged quark thingies — uhhhmmm “emissions” into the reactor to fuel the whole thing. Yes, friends in neighbors, all this chaos ensues inside your body, and you go happily off to your walk in the park. Your muscles and circulatory and respiratory systems didn’t really ENJOY all those flashing red lights and tilting decks so . . .
when you finish your “exercise” also known as “the activity that shall not be named” they start huddling in the hallways and turbo lift tubes and begin planning an uprising! And all returns to normal. You, the Captain of this enterprise decide that since the first effort went so well (from your point of view) that you are going to continue the advance into unknown space (otherwise known as “being healthy”). And you go for another walk in the park two days later or you take the clothes you’ve sorted and you carry them to the laundry room and put them in the washer . . .
RED ALERT! ALL HANDS ON DECK! Whoop! Whoop! Cue the flashing red lights and the tilting deck and the crew being thrown from to side to side. And yeppers you guessed it, this time the crew is really starting to get concerned… TWO alerts in the same week. Wow! These are some really nasty aliens! You have to make repairs after a battle . . . So, this cycle continues. And eventually when you call for battle stations the crew, aka your muscles and respiratory systems and circulatory systems takes it in stride. You end up with a highly trained and functional crew capable of handing out the level of stress that you’ve dealt out. But ONLY to the level you’ve dealt out. Remember, the crew is LAZY! So you have to go find tougher aliens to fight or in the “real world” you walk for 3o minutes in the park instead of the 20 minutes you did when you first started. I was worried about my “crew” . . .
Here’s the deal. I know about this so I wasn’t surprised when my body “demanded” rest after I “exerted” myself. I was expecting it. Yesterday, Sunday, I went to Braums to get some groceries. If you’ve never heard of Braums and you live in Texas or Oklahoma, then SHAME on you! Go try their milk; but I warn you, once you’ve had it, there is no going back. Yummmy! Everyone else in the world.. well you wish you lived in Texas and Oklahoma don’tcha! grin Well at least for the milk and other farm products from Braums, not for the idiot politicians who… ahem that’s a post for another time…. So, if you’ve never been to Braums, it is not just a fast food / ice cream fountain place. It is also a mini-grocery store with a produce section, a HUGE dairy section (of course) and has a selection of other staples like bread, meats, condiments, etc. The thing I like about going to Braums right now as opposed to say, Kroger or some other large grocery store is that I can “do groceries” in a vastly shorter time which is important because at the end of a grocery run, I am pretty much toast. Sad, I know. But accurate. So, yesterday I went to Braums to get “groceries” and I ended up with five of those “reusable tote bags” of food. Total time elapsed, about 30-40 minutes from front door to unloading stuff into the fridge. grab my bags and head to my truck, put the food into the truck, return the buggy to the store, drive home, crawl, proverbially, out of the truck, grab the bags, the FRIGGING VERY HEAVY BAGS, and carry them in two trips to the bottom of the stairs, then in three trips carry them up the stairs — did I mention they are heavy? Oh, I did, good. Then unload the cold stuff into the fridge. Get up, eat, go back to bed and sleep for another two hours. What I found out . . .
Well, I confirmed what I already knew about the “exercise – rest & recovery” cycle. That the body demands a rest period. What was concerning me was the AMOUNT and the INTENSITY of the demand I was getting from my body. Imagine a scale of Zero to 10 where “zero” is you sitting at your computer (like I am at the moment). Ten would be “emergency” where you are “running for your life from a mugger” — an all out no holds barred effort. Two would be movement that your body has gotten used to, say, walking down the hall to go tinkle or to refill your cup of coffee then return to your desk. Movement where the crew of your Starship, uhmmmm, body continue at their posts with no extra effort required. Routine, normal. FIVE or SIX would be “Red Alert” where you demand that the crew get up off their lazy butts and shove the red shirt guy out the airlock to be fed to the nasty-alien-of-the-day. A “normal” bout of exercise would be for someone to exercise up to a 5 or 6 level, maybe even a 7, in the morning then for the rest of the day, keep the activity down around two. The following day, do no activity higher than a 3. Then do the whole thing over again. The PROBLEM I am encountering is that for me now, what “should” be a two, “going grocery shopping” is literally, with no exaggeration I-kid-you-not, a 9.5 pushing toward ten! Basically think of my body after exercise as the Enterprise at the end of “Star Trek; Into Darkness” (a movie with more plot holes than Swiss cheese but with very pretty actors, some witty dialogue, and great special effects) but I digress…. I mean, come ON! That ship was TOAST! HUGE gaping holes and smoke pouring out of (and how the hell does smoke “pour out in a stream” in space and in the midst of all that they somehow manage a call to New Vulcan! but can’t call for help to Earth which is visible in the background? Huh? What? Dude they could have used signal flags they were so close to the planet, I mean come on, like Star Fleet isn’t MONITORING LOCAL SPACE and already has them on radar and under visual observation? I told you… PLOT HOLES!) But I digress.. The point dear readers, is that after my little trip yesterday to the grocery store (Braums) I was like the Enterprise, caught in Earth’s gravity falling, full of holes, smoke pouring out, stabilizers shot, no thrusters, and everybody going down with the ship and the Captian literally trying to kick start the warp core by uhmmmm well, kicking it. So I slept. A lot. Which concerned me. I shouldn’t be concerned. It is a matter of scale. If I put forth a HUGE effort, I should expect a corresponding HUGE DEMAND for rest and recovery. For now. Eventually things will stabilize and my body won’t demand so much rest and recovery. Then I’ll need to increase the level of exercise and the whole cycle starts over again. This morning I woke rested, and ready for a day of moderate level 1 or level 2 activity. Which for me is doing 1 basket, two loads, of laundry. That’s it. And to confess, that may actually push me up to a 4 or 5, but I really do need to do the laundry. sigh So I’ll do it very slow, spacing out trips to the laundry room over an extended time frame. There is a temptation shared by folks like “Moí” who is just starting out, and by athletes who are at the top of their game. That temptation is to keep pushing forward no matter what. The REST & RECOVERY period is crucial. Because THAT is when you muscles are rebuilt and built stronger in the process. Kinda like the Six Million Dollar Man…. without the cheesy sound effects. If you keep pushing and ignore your body’s demand for down time you risk injury and you will NOT see as much benefit from your exercise as you could get. So don’t freak out (like I was doing) if when you are terribly out of shape, your body says “sleep away the whole afternoon” because you “exercised” for 30-40 minutes. It is normal. Your body has millions of years of genetic experience built into it. Listen to it. But don’t let the crew run away to the cantina and the holo decks. So folks there you have it. Google it yourself, you’ll find I’m essentially, if colorfully, correct in what I’m telling ya. 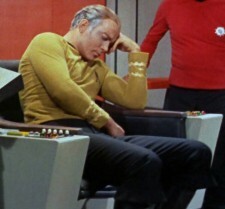 Posted on Mon, May 19, 2014, in Misc and tagged exercise, fitness, George Takei, Health, importance of resting, into darkness, over training, recover, red alert, rest, sleep, Star Trek, starting an exercise program. Bookmark the permalink. 2 Comments. Very entertaining post! LOL….. Congratulations on your grocery shop and laundry!!! Hang in there my friend. It won’t be long before all those mundane tasks will be routine everyday stuff again. Your muscles have memory and will remember what it was like to be able to move your body and stomp your feet to the sound of that awesome Country Music!